Why does it need a lime? It’s a beautiful day. Thirty degrees above zero. You’re in Mexico. You want a beer. It’s 3pm and the bar has been in the sun until noon. Bartender hands you a Corona. The bar is out of limes. Why is this a problem? 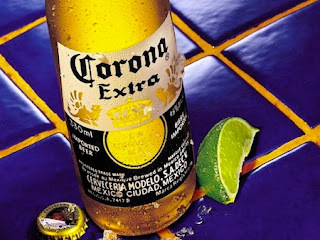 Corona is served with a slice of lime to cover up the unpleasant consequences of natural light oxidation on flavor. Isohumulones are responsible for the bitter taste we associate with beer. When beer is exposed to natural light, the isohumulones react with trace sulfur compounds to form MBT 3-methyl-2-butene-1-thiol (MBT). This compound has a distinct “skunky” flavor, and is very similar in structure to the mercaptans that a skunk will spray its attackers with. No shoes, no shirt, no lime, no problem. How do you prevent this? Heat speeds up the oxidation, so keeping the beer in a cold and dark place (like a fridge – not an ice bucket) is the best strategy. However, chances are you won’t be able to bring your bar fridge along to the beach, and a Coleman cooler can only hold so much beer. Clear bottles, like the ones used by Corona and Sol, are most susceptible to light exposure. Green bottles are not much better, thus Dos Equis and many European pilsners are also at risk. Brown glass provides the best protection against light oxidation, but is not immune to the effects of long-term exposure to light. 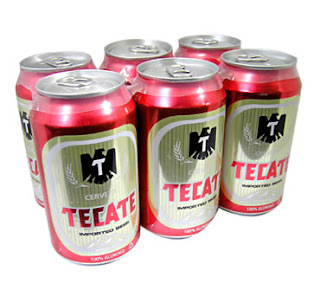 If the bar is out of limes, see if they have Modelo or Pacifico, both available in brown bottles, or Tecate or Pacifico in cans. I like to drink beer in the kitchen, but I have my rules. No beer until after the knives are put away. Safety first. Sweet potatoes in particular have always been a problem – they’re just too hard to cut raw. Thus, I always end up with chunks that are too large, with an undesirable mushy texture throughout. Cooking them in their skins before slicing makes them far easier to cut, and . Smaller pieces = crispier fries. Problem solved. I like to add lime zest to mine because I’m original. You should be too. Toss the fries in a bit of cumin, chili powder, or smoked paprika, to spice it up. Or just keep it simple and let the chipotle aioli do the talking. 1. Preheat oven to 350°F. Line two shallow baking sheets with aluminum foil, shiny side facing out. 2. Scrub the skin of the sweet potatoes and punch holes in the skins with a fork. 3. Place the sweet potatoes on the baking sheets and bake for 30-40 minutes. 4. When the sweet potatoes begin to , remove them from the oven and cut into . The centers should still be firm and undercooked. 5. Drizzle with olive oil and toss with lime zest, salt, and black pepper. 6. Return fries to baking sheet in a single layer. 7. Bake for another 20-30 minutes until crisp around the edges. 8. Serve warm with chipotle aioli. 2. Serve as a dip with sweet potato fries, or as a spread for sandwiches. Note: To make chipotle puree, blend the contents of a 7 oz. can of chipotle chiles in adobo sauce until smooth. Add this stuff to anything – hummus, tomato sauce, mac n’ cheese, cornbread, chocolate...maybe.